So wait, why exactly is sitting so incredibly bad for you? You’re probably wondering exactly why sitting too much is bad for you. As you can imagine, part of it ties into the dangers of a sedentary lifestyle. According to the World Health Organization (WHO), physical inactivity is the fourth leading risk factor for global mortality. Each year, it’s causing an estimated 3.2 million deaths worldwide. While sitting is associated with being sedentary — which is awful for your health — it has its own distinct adverse effects, even for people who exercise, eat a healthy diet, and aren’t overweight. Prolonged periods of sitting down are bad for your cardiovascular health, even if you work out every day. The causal mechanisms aren’t completely clear yet. Researchers have suggested that when you don’t use the muscles in your legs and back for long periods of time, it may reduce the activity of certain enzymes, resulting in less insulin secretion, higher blood sugar, and higher levels of cholesterol. Sitting at your desk for hours on end could theoretically be shortening your lifespan. 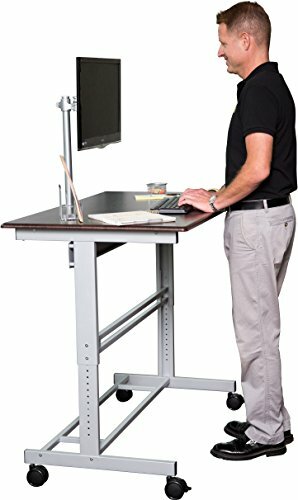 Standing desks are a way to mitigate the health risks of sitting down too much, without compromising your ability to work when you’re programming. Some of the health benefits that come with switching to a standing desk can include the following. ● Lower your obesity risk. While it’s worth noting that standing doesn’t really burn that many more calories than sitting, and that it’s no substitute for exercise, using a standing desk may contribute to lowering your risk of becoming overweight or obese. There’s a known correlation between moving more and sitting less, and maintaining a healthy weight. A standing desk, paired with periodic breaks where you walk around and stretch your legs, are a great start. ● Improve your blood sugar and cholesterol levels. Recent research studies, including one from the University of Queensland in Australia, have found that standing instead of sitting is beneficial for both cardiovascular and metabolic health. They found that standing was associated with lower blood sugar, lower triglycerides, and even a lower BMI. ● Reduce your risk of some types of cancer. Both breast cancer and colon cancer have been linked to inactivity. Spending more time on your feet by using a standing desk could help you boost the amount of activity and use that your muscles get every day. ● Improve your posture. It’s all too easy to slouch or hunch over while you’re typing in a seated position. Standing desks can go a long way toward improving your posture. ● Improve your core strength. While it’s no substitute for crunches and situps, standing for prolonged periods of time engages and strengthens your core muscles. ● Prolong your lifespan. By incorporating the use of a standing desk into a healthy lifestyle that reduces your risk of heart disease, cancer, diabetes, and other preventable health problems, you can live a longer life. ● Get more done. Standing desks may help workers become more productive. When you’re standing up, you may find yourself feeling more alert, more energized, and more mentally sharp than usual. Standing desks aren’t necessarily a one-size-fits-all product. There are actually several different types of standing desk, and one might make more sense for you than the others. Some are adjustable, meaning you won’t have to stand one hundred percent of the time. Here’s a quick rundown of the options you’ll find. This is probably the simplest way to start using a standing desk. It’s also more affordable than buying a whole new desk, and it’s something you can bring to the office to convert your workspace. Many of them are even lightweight and portable. A desktop attachment is a great way to start experimenting with standing at your desk at work, without committing to a larger purchase. Many of these simply sit on top of your existing desk, and allow you to raise or lower your monitors, mouse, and keyboards on demand. One downside to these options is that they might not handle your computer monitors. You’ll need to check the weight restriction and if the unit is wide enough to handle multiple screens. 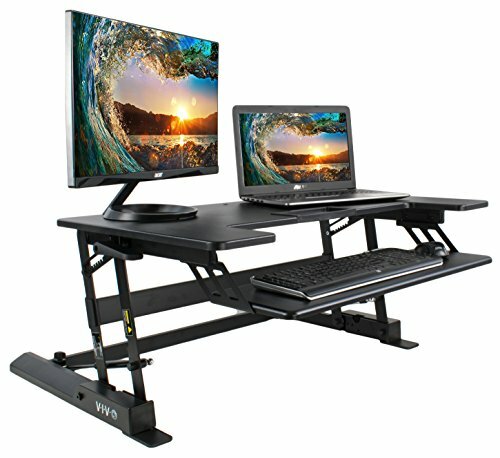 These kinds of desks are just for standing, and are not adjustable. These tend to be pretty inexpensive, but limit you to standing-only, so it’s often more of a commitment than many programmers like to make if it’s their first standing desk. Without a doubt, these are the best standing desks for programmers. While they are more expensive and sometimes require more assembly, they give you unrivaled versatility and value. 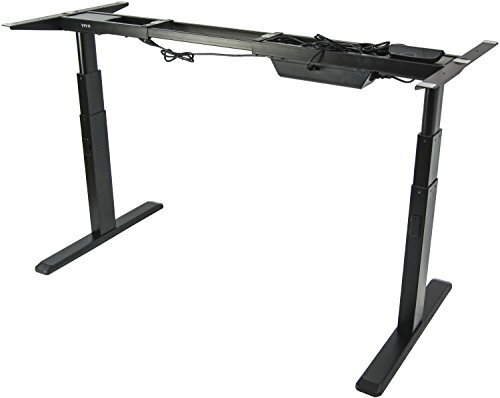 When purchasing an electric standing desk, you often are only buying the base (basically everything except the table top). Many people find a table top to attach the base to from a salvage store, or a wood Ikea counter top is another great cheap option. Once you have everything assembled, you simply plug the desk in and use some buttons to adjust the height from a sitting or standing position. Many of these bases now have memory in their controls which save your sitting height and standing height preferences and maps them to a button. So with only a press of a button, it will automatically move from your sitting to standing position and vice versa. Transitioning to a standing test is one of those things that can take some getting used to. You may want to start slow, standing up for just twenty or thirty minutes at a time. When you’re used to sitting, standing for a long time can feel a bit more physically demanding. It’s also important to make sure your new standing desk is set up correctly. Ideally, your screen should be anywhere from fifteen to thirty inches away from your face. Your wrists should sit flat, to avoid positions that can lead to carpal tunnel. Once you get used to it, you’ll probably find that standing sometimes while you work actually feels a lot better than sitting down the whole time. There’s only been a little bit of research so far into the benefits of standing desks in particular, but it’s been established that sitting too much isn’t good for you. Along with using a standing desk, make sure that you move around during the day. Walking at least 1500 steps daily can help a lot. When you’re taking a short break from your work, get up and walk around the office a bit. Not only does it feel refreshing, but it’s good for your body. With a standing desk, plus a little more movement throughout the day, you can improve your health and enjoy a longer life.